Our kids are big fans of two things when it comes to entertainment, television shows and iPhone/iPod apps. When you put their two favourite things together, you're guaranteed a hit. We are huge fans of Chuck and Friends here in our house, our little guy loves anything to do with planes, trains, cars and trucks. We were first introduced to Chuck and Friends through the toys "Chuck My Talking Truck" and various other play sets that always caught our little guy's eye. It wasn't far after that Tree house TV began airing Chuck and Friends episodes, our little guy was just over the moon. 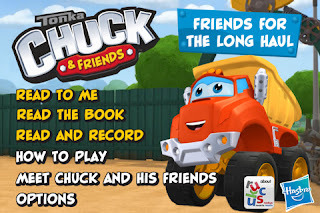 Recently we were asked by Ruckus Media if we would like to try out their newest kids app Chuck and Friends: Friends for the long haul for iPhone/iPad. Two of our little guys favourite things in one place, Chuck and Friends on iPhone! “Bumpers up!” Join Chuck and his friends as you tap the screen to learn letters and words, play games and watch videos. This interactive reading adventure is ideal for young truck-lovers, fans of HUB TV and Hasbro toys. Read along as Chuck and his pals embark on a journey where they learn about honesty, teamwork and friendship. Bold graphics and bright colors make “Chuck and Friends: Friends for the Long Haul” an enjoyable and engaging way to learn to read. Get ready for some four-alarm fun! Chuck and his friends are playing their favorite game (chasing bad guys) when they encounter Flip, a new vehicle in the scrap yard. Chuck is not so sure about Flip and challenges him to a stunt contest. In the process, the two realize they can work together and become fast friends. Little guy absolutely loves the app, he plays it on iPhone with Daddy. I always like a good interactive apps for my kids. They are alot better than nonesense games made strickly for entertainment. I enjoy watching my kids engage in activity with the app and smile the whole way through. If you've got a fan of Chuck and Friends plus an iPad or iPhone, you'll want to download this goody for your next road trip or rainy afternoon at home. You can download Chuck and Friends: Friends for the long haul at the app store or through iTunes. There are full and lite versions available! *This is not a sponsored post. We received a free download of Chuck and Friends:Friends for the Long Haul for review purposes but were not obligated to write this post by any means. Information about the mentioned app was found via the iTunes website. All opinions are honest and those of A Motherhood Experience.